The NFL season may be over, but the recognition for this past season’s star players isn’t. The recent NFL Honors awards ceremony took place to recognize the league’s best players. That included awards for NFL Most Valuable Player Patrick Mahomes of the Chiefs and Coach of the Year Matt Nagy of the Chicago Bears. 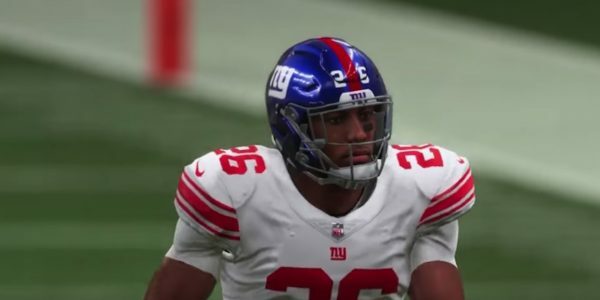 As of Thursday, Madden 19 NFL Honors content arrived for Ultimate Team gamers to honor the league’s top rookies. Each season, there are NFL Rookie of the Year awards handed out for one player on offense and one on defense. There wasn’t much of a competition when it came to this year’s selections, as two rookies, in particular, were quite dominant. On offense, nobody achieved more than Saquon Barkley did in his first season as a running back for the New York Giants. He tallied 1,307 yards and 11 touchdowns on 261 carries on the ground. He also caught 91 passes for 721 yards and four touchdowns. While the Giants didn’t reach the postseason, there was a chance towards the end of the season. After his rookie campaign, things certainly look bright for the team’s future too. On Thursday, Madden Ultimate Team gamers can look for a limited time Barkley card with a stellar rating of 98 overall. On the other side of the ball, the Indianapolis Colts have a stud when it comes to their future defense. Their 6-foot-2 linebacker Darius Leonard helped with by achieving 111 solo tackles and seven sacks as well as four forced fumbles this past season. That performance, by the man nicknamed “Maniac,” was part of a defense that ranked No. 11 in terms of total yards allowed for the 2018-19 campaign. They were also among the top 10 rushing yards per game defenses this past season and made it into the NFL Playoffs. 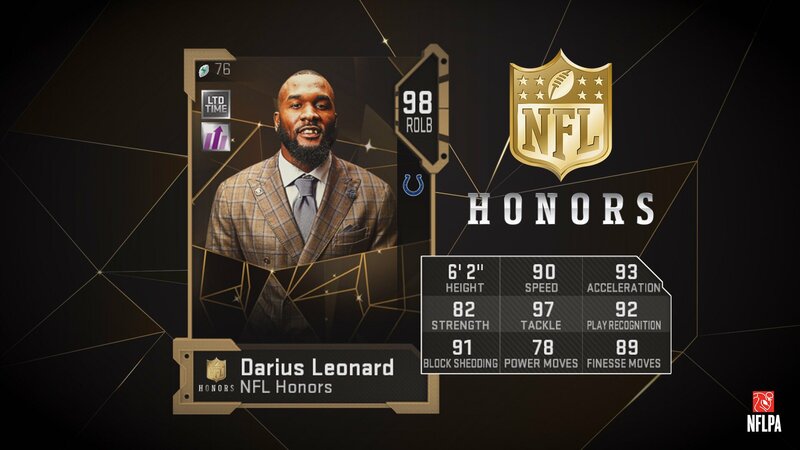 The future looks bright for Indy, and the Madden 19 NFL Honors card for Darius Leonard shines bright with a 98. It includes skill ratings of 97 Agility, 97 Carrying, and 95 Speed, among others in the 90s. This card, along with Barkleys, is available for a limited time through the MUT packs. 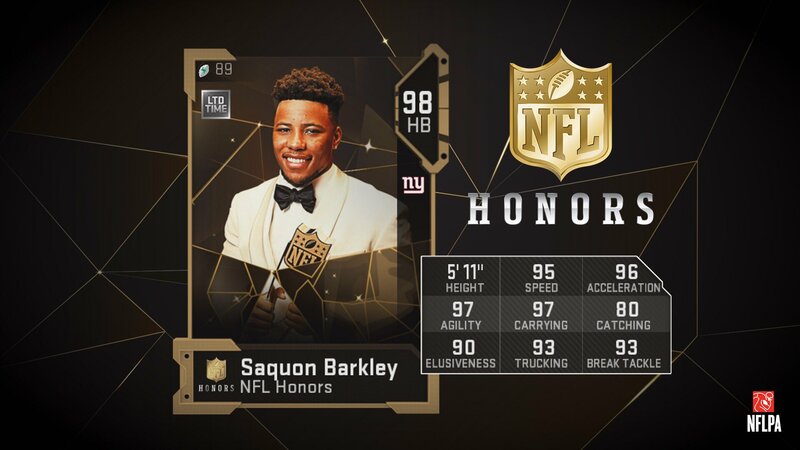 Of course, Barkley and Leonard are just two of the new NFL Honors cards that are available in Madden 19. On Wednesday, they announced an Andrew Luck card, Kyle Long, and a tribute card for former Carolina Panthers defensive standout Julius Peppers. As seen in EA Madden Ultimate Team’s tweet above, these cards carry 97 or 98 ratings, making for more great ways to upgrade MUT rosters. All of these cards are for a limited time, so fire up that game system and get these players on the field with your squad ASAP! See more of our recent news, information, and help for the game at our Madden page.